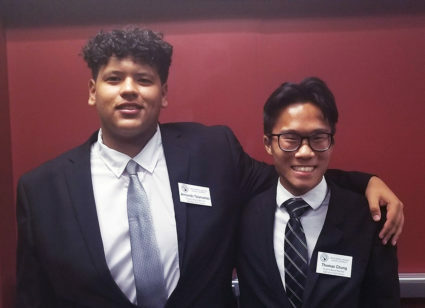 SAN GABRIEL, CA – Gabrielino High School senior Thomas Chung and Del Mar High School senior Armando Talamantes will serve as San Gabriel Unified’s 2018-19 Governing Board student representatives. Chung and Talamantes were sworn in at the Oct. 9 and Oct. 23 Governing Board meetings, respectively. Thomas Chung has explored his passion for journalism, volunteerism and social advocacy on Gabrielino’s campus, where he is opinion editor of the Tongva Times, secretary of the Red Cross Club and president of the Gender and Sexualities Alliance. Chung, who holds a 4.39 GPA, plans to study either sociology or political science in college and hopes to pursue a career where he can make an impact on the world. Talamantes is a member of Del Mar High School’s Associated Student Body and serves as the school photographer at ASB events. After graduating from high school, Talamantes plans to pursue a degree in mechanical engineering. SANGAB_STUDENT_REPRESENTATIVES: Gabrielino High senior Thomas Chung and Del Mar High senior Armando Talamantes will serve as San Gabriel Unified’s 2018-19 Governing Board student representatives. Gabrielino High senior Thomas Chung and Del Mar High senior Armando Talamantes will serve as San Gabriel Unified’s 2018-19 Governing Board student representatives.